Bharat Sevashram Sangha (Bengali: ভারত সেবাশ্রম সংঘ) is a Hindu charitable non-governmental organisation in India. 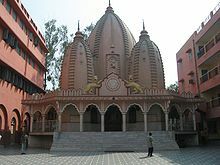 It was founded in 1917 by Acharya Srimat Swami Pranavanandaji Maharaj. The Sangha has hundreds of ashrams in India and other countries including the United Kingdom, United States, Guyana, Trinidad and Tobago, Canada, Fiji and Bangladesh. It has initiated several missions to African countries, Malaysia, and Indonesia; monks from the Sangha have accompanied United Nations delegations to Syria and Lebanon. The Sangha is recognized for their community work, helping poor and providing healthcare to those in need. The Sangha has responded to natural calamities in Andhra Pradesh and Orissa states, the Bengal famine of 1943, the Bhopal disaster, the 2001 Gujarat earthquake, and the 2004 Indian Ocean tsunami. At times of political unrest such as the Partition of India, the Sangha has set up refugee camps and war evacuee camps in the border areas. It has organised several projects to help impoverished Indian tribal people. One such project involved providing schooling for children of the Sabar tribe and providing them with housing and healthcare. It also hosts courses to train youths in information technology to enable them to find jobs which require IT skills. Following the 2004 Indian Ocean earthquake, the Sangha's monks proposed to set up a school for orphans at a cost of Rs. 4250,000s, an orphanage at Rs.6020,000, and 200 houses at Rs.30 millions on the Andaman and Nicobar Islands. In Tamil Nadu state, where the tsunami killed more than 7,000 in the districts of Cuddalore, Nagapattinam and Chennai, the Sangha was one of the first to begin massive relief operations by building nearly 200 new houses at Sonankuppam village in Cuddaloer. Fishing boats and nets were also distributed to locals who had lost everything to the sea. The Sangha actively provides shelter, food, medical treatment and public safety services to pilgrims at various places of worship and religious fairs in India, such as the Kumbha Mela. It operates free hospitals at Barajuri and Kolkata, mobile dispensary and medical units in sixty-four locations, a free residence for patients and their families in Navi Mumbai, and four hospitals and homes for leprosy patients. A 500-bed hospital at Joka, Kolkata was inaugurated in 2010 by the Indian Finance Minister as an example of private-public partnerships in healthcare. ^ Deepak Dasgupta (17 August 2008). "Bharat Sevashram Sangh". Organiser. Retrieved 25 November 2008. ^ Sanjay Ojha (18 May 2005). "The winds of change – Tribes at crossroads". Calcutta Telegraph. Retrieved 15 November 2008. ^ Jayesh Thaker (19 March 2005). "Dreams crash for tech band – Tribal youths face uncertain future after completion of computer course". Calcutta Telegraph. Retrieved 15 November 2008. ^ "Monks to take up rehabilitation in Andaman and Nicobar". The Hindu. 19 February 2005. Retrieved 15 November 2008. ^ a b Staff Reporter (5 April 2010). "Hospital for poor opens doors". Calcutta Telegraph. Retrieved 16 November 2010. This page was last edited on 16 March 2019, at 05:42 (UTC).